In Build 2015, Scott Hanselman announced one really cool tool Visual Studio Code. I thoroughly enjoyed his presentation. So, as soon as he done with the presentation, i just downloaded the same from http://bit.ly/visual-studio-code and started testing the same. Best thing is that it installed in a minute literally in a minute. So, 1st reaction is fast and amazingly fast. For people like me who love coding and can’t manage to have full suite VS installed on all the machines, Visual Studio Code is a boon for them. It gives me all the required intellisense what is offered in VS, plus this is platform independent. So, doesn’t matter whether i am running on Windows, MAC or LINUX. 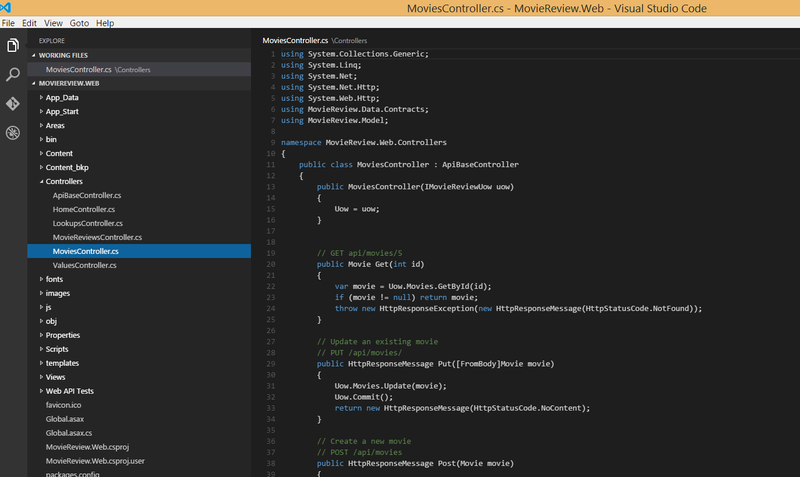 I can open the file in Code, get the real time feel of VS; do the changes and bang. Let’s jump to quick demo. Below is the snippet of my movie review app where in i have added my API with ease from VS Code. Here, you can see we also get same intellisense support as we get from VS.
Also, if you want to quickly jump between the files and do some changes, you can do the same with CTRL+O option as shown below. While writing test case also. we get the similar intellisense support. Also, we can go ahead and debug our app and we get call stack, watch and variables as well. For debugging little environment settings needs to be done in project.json file. This is well drafted in VS Code documentation. Thanks for Joining me. This entry was posted in Visual Studio, Visual Studio Code and tagged Visual Studio, Visual Studio Code. Bookmark the permalink. ← When to choose what?